Continuation of the description of some groups of roses. 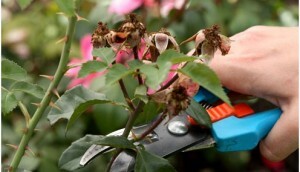 In this article, special attention will be paid to the description of such a group as ground cover roses. 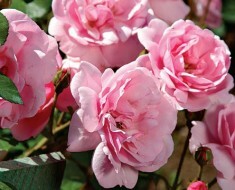 small creeping roses, reaching a height of 30-45 cm and not more than 1.5 m wide. 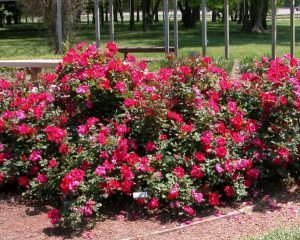 large creeping roses with a height of more than 45 cm and a width of more than 1.5 m.
small drooping roses up to 95 cm tall and not more than 1.5 m wide. large wilting roses are higher than 1 m, and a width of 1.5 m.
The builders grow horizontally and sometimes they can take root in the nodes, while the drooping ones form a sprawling bush with arcuate drooping branches. Uncomplicated. They have a continuous continuous flowering, resistance against diseases and increased winter hardiness. Properties of all ground-covering roses. Usually blossom once, but there are also re-flowering.